Hence we may argue Fifth, from the infinitely more excellent fruit of that [saving] grace, which is the effect of the ordinary gifts of the Spirit, than of the extraordinary gifts, since grace is saving but those extraordinary gifts are not. The Apostle tells us in the text that those extraordinary gifts of the Spirit profit nothing without charity [love]. A man may have them and go to hell. Judas Iscariot had them, and is gone to hell. And Christ tells us of many, who have had these extraordinary gifts, whom he will bid in that day to depart from him as workers of iniquity. “Many will say unto me in that day, Lord, Lord, have we not prophesied in thy name? and in thy name have cast out devils? and in thy name done many wonderful works? And then will I profess unto them, I never knew you; depart from me, ye that work iniquity” (Matt. 7:22-23). And therefore when Christ promised the disciples the extraordinary gifts of the Spirit, such as casting out devils, and other extraordinary gifts, he bids them not to rejoice that the devils were subject to them; but rather that they should rejoice because their names were written in heaven; intimating that men may have this power of casting out devils, and their names not be written in heaven (Luke 10:20). This shows that grace which is the effect of the ordinary gift of the Spirit is infinitely a greater blessing than the extraordinary, since it carries eternal life in it. Eternal life is a thing of infinite worth and value. And that must be an excellent blessing indeed which has this as the fruit of it. The value of any possession is known by the fruit or profit which is obtained by it. “Better is the end of a thing, than the beginning thereof” (Eccles. 7:8). By this therefore, that blessing of the grace of God which is the fruit of the ordinary gifts of the Spirit is infinitely more precious than that of the extraordinary gifts. He [Christ] thus loved us without any expectation of ever being requited by us for his love. He did not stand in need of anything we could do for him, and knew that we should never be able to requite him for his kindness to us, or do anything towards it; for he knew that we were poor, maimed, halt and blind, empty needy vagabonds, who could only receive from him, and could render nothing to him. He knew that we had no money or price; that instead of receiving anything from us, he must give us all things that we needed, or we should be eternally without them. Now how far shall we be from a selfish spirit, and how contrary to it, if we love one another after such a manner, or if there be the like spirit of love in us towards others which was in Christ towards us. Our love to others will not depend on their love to us; but we shall do as Christ did to us, love them, though enemies. We shall not only seek our own things, but we shall be in our hearts so united to others that we shall look on their things as our own. We shall look on ourselves interested in their good, as it was in Christ towards us. We shall be ready to forego and part with our own things in many cases for the things of others, as Christ expended and was spent for us. And these things we shall do without any expectation of being requited by them, as Christ did such great things for us without expectation of any requital from us. Christ, as it were, spent himself for us. Though we were enemies, yet he so loved us that from love to us he had a heart not only to look at our things, but to spend his own things for us, to forego his own ease and comfort, and outward honor, and to become poor for us. “For even Christ pleased not himself; but as it is written, The reproaches of them that reproached thee fell on me” (Rom. 15:3). And not only so, but to spend himself for us, to spend his blood, to offer up himself a sacrifice to the justice of God for our sakes. 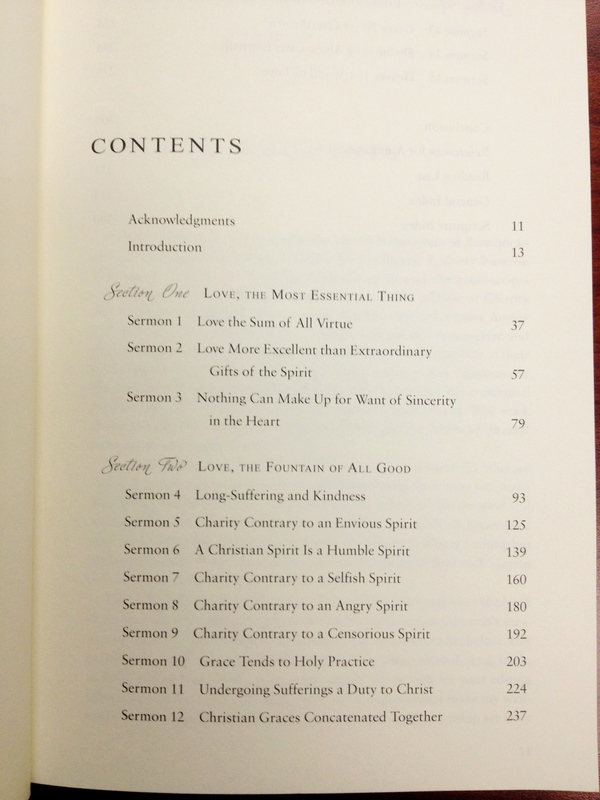 Crossway Books recently published a good-looking new version of Jonathan Edwards book: “Charity and It’s Fruits” edited by Kyle Strobel. 1. What is ‘Charity and It’s Fruits’ about? In 1738 Jonathan Edwards preached a series of fifteen sermons expositing 1 Corinthians 13. 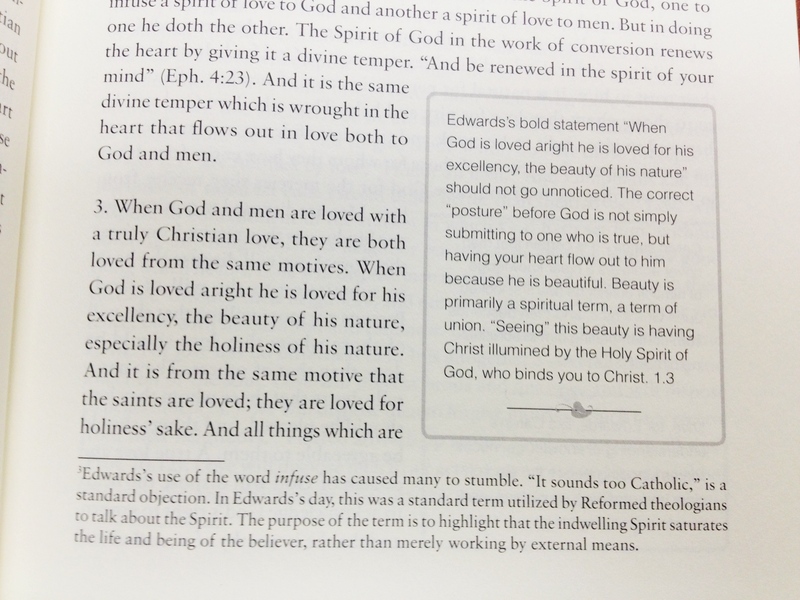 These sermons provided a “theological account of love and virtue” and were never published in Edwards lifetime. It is a work that takes a long look at the glorious love passage in 1 Corinthians 13 and examines and exposits each verse with each sermon ending with words of application. 2. Why should I read ‘Charity and It’s Fruits’? First, to have your soul refreshed in the love of God towards you and His power for you to now live a life of love in light of His love. Second, as this work is, according to the editor, “one of the best entry points into Jonathan Edward’s theology… an intricate tapestry of Edwards’s spiritual, theological, and exegetical insights, exposing readers to a much broader picture of his work.” It is a great opportunity to read one of America’s preeminent theologians and wrestle with his theological and practical reflections. 3. Why should I read this version of ‘Charity and It’s Fruits’? Second, this particular version of ‘Charity and It’s Fruits’ is far more than a pamphlet of photo-copies of the original manuscripts and it is certainly not any type of abridgment or restatement. It includes a detailed introduction giving an overview of Jonathan Edwards theology to help the reader grasp the larger body of thought behind this work. Then it ends with a conclusion considering how one might appropriate this work. It also includes over 150 explanatory notes within the text addressing difficult concepts throughout the text as well as definitions to arcane terminology to help the modern reader. It even will list relevant quotes from Edward’s other writings as well as appropriate. All in all this is a great new version of an old classic. For a sampling of quotes from the book I have and will continue to post them here at The Old Guys. You can view them all in one place at this link. 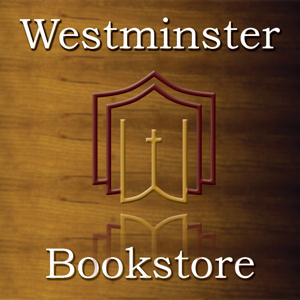 Pick this book up and embark on a meditation of that most glorious theme of God’s disposition toward us in Jesus Christ and the most essential element of our lives as Christians: Love. Disclosure: This book was received for free as part of a blog reviewer program, however I was in no way obligated to review it either positively or negatively. Let a man have what he will, and let him do what he will, it signifies nothing without charity. Which surely implies that charity is the great thing, and that everything which has not this some way or other contained or implied in it is nothing; signifying as much as that this is the life and soul of all religion, without which other things that bear the name of motives are empty and vain. And particularly faith is here mentioned as being nothing without it. That faith which has not love in it, though it be to such degree that men could remove mountains, yet is nothing, like an empty, vain thing, and like the body without the spirit. 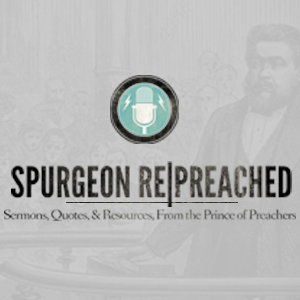 Jonathan Edwards – What Manner of Persons Ought You To Be! Let those, therefore, who are thus highly favored, consider more than ever yet they have done, how great that blessing is which God has bestowed upon them of his mere free love and sovereign grace, and not for any worthiness of theirs; and how great obligations they are under to glorify God: and to glorify Christ, who hath purchased this blessing with his own blood. What manner of persons ought you to be! pray consider it! Do you hope that God has thus highly advanced and exalted you? And will you not be careful indeed to live to his glory, and to exalt and magnify his name? Will you dishonor Christ, who has thus honored you? Will you regard him but a little, who has shown such infinite regard to your welfare? Shall the world have your heart, and Christ and his glory be neglected after all? Will you not rather watch against your corrupt, worldly, proud dispositions? Will you not seek opportunities to do something for God, who, as you think, has been thus kind to you? 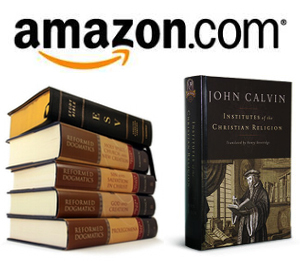 And for that Savior, who has purchased this, at the cost of such extreme sufferings?